After the Climax what’s next with the Roof? Ok, so maybe it wasn’t really such a thrill when that last rafter locked itself in place, but it certainly started the wrap up of work on the roof and upstairs in general for this season. As you know if you’ve read earlier posts, I have dozens of different areas to work in, each one of them having some sort of crisis or other at different times. Gardens were planted more or less on time, but I couldn’t give them near enough time. I managed to build a few new raised beds, but there was still lots more that could have been done. Starting a few new perennials in the food forests and gardens are ongoing projects. Hand work on the dams was a main time consumer for a while, sorting through clay, rocks, wood and getting the clay onto the top of the dam. Both expanding the swale systems and fortifying the dams remain primary concerns. 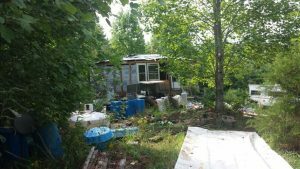 Preparation of areas for the backhoe, clearing brush and trees, surveying swale lines, and cleaning away debris from other areas all remain as projects to complete before the fall. So even with the urgency of a better roof system, the Main Frame Water Design is still the project that is most on my mind and the limiting factor on how much more time can go into the upstairs and the roof. The water design requires time to mature, and incomplete dams invite setbacks, so if the roof rafters being fitted in place was exciting, getting all the dams up to height, with swale systems planted and functional will be an ecstasy that goes on for a long time. As my energy starts going back toward the water design most of the roof will still rely on temporary elements and those elements will need some ongoing attention. With fiberglass panels that are deteriorating rapidly, a tarp with many tears and holes, and Tyvek as the current covering, they will all need to either be replaced or reinforced over time, and while this last mild rain only produced a couple leaks, I know for sure that the first really strong wind could expose large areas to the rain. 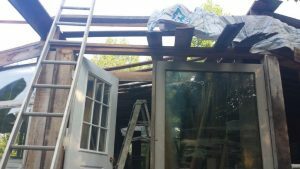 Then there are the finer points of roof construction, the eaves and gutters and all those things that really make a roof permanent and maintenance free. Yes, I’m happy about being able to make the step to a better roof structure, but overall the roof remains on the list as one of many works in progress. Once a good permanent structure is in place, the roof can disappear altogether as an energy drain . 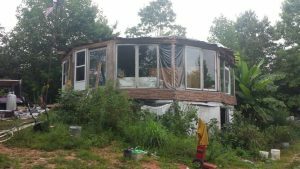 Posted on August 11, 2017 August 14, 2017 Categories Permaculture attitudes, structuresLeave a comment on After the Climax what’s next with the Roof? I’ll start with some descriptions and pictures, and follow with a more detailed work diary. This structure was a 12 sided polygon with two temporary walls running across the structure about 8 feet apart, dividing the yurt into three parts. The back and side walls were originally set at 8 feet tall and the back central temporary wall was set at 10 feet tall with a rectangular sloping roof overhanging the back part of the structure. The front central wall was set at 8 feet and had a sloped roof connecting to the 10 foot wall and covered the central part of the building. The last section of the temporary roof to be built included a design change to exterior walls in front that used 80 inch studs, just tall enough to accommodate a standard door frame. That part of the roof was less than half the slope of the other sections. Middle and back sections of temporary roof. First half of the center section with roof being removed. The 10 foot walls on right, 8 foot walls on left. At the far end note the space between the board just over the door, and another horizontal board higher up, this is the difference between the original design height of the outside walls and the final height that all walls had to be brought down to. Lucky enjoyed playing on the roof, this extension of the 10 foot central wall was dismantled shortly after this picture. I remembered the evening I had to climb on that part of the roof at twilight to get her down from her perch on the windmill . the front (south) section of the temporary roof had a tarp that conformed to the curvature of the walls. These guys (brown wasp nest center of picture,)surprised me, but did not sting. Getting up very early on cool damp mornings proved to be the best way to handle them. Many wasps were moved outside, and most of them survived to tell the tale. No poisons had to be used, and while I did get stung a couple times during the whole project, the ironic thing was that I was stung many more times and far worse while weeding around a comfrey transplant in the food forest by ground wasps. As often as I encountered the mud daubers and paper wasps, and as many times as I surprised them (or they surprised me ), mostly they just buzzed at me and let me know they were unhappy. The truth is that I am starting to develop a genuine fondness for some (though not all) of these guys. As I look at this picture there was probably some construction detail I was trying to record, but now all I see is a huge mess. This picture is a great demonstration of the total disregard for planning or permanence when rain is imminent, just throw up some supporting walls, lay any wood you have laying around on top of it and cover it with anything you think might be waterproof. Let the wind and the rain tell you where/when to reinforce or do better. this particular roof only was in use for two days of rain. the old roof tarp being moved to one side getting ready for new rafters. After the new rafters were installed, a couple fiberglass panels went down and the tarp was moved back. The long board sticking out beside the top part of the ladder will have to go-it was part of the temporary wall and in the way of new rafters. Getting the main rafters laid out in place. Note the top wall plates are actually 4 separate 2×6 boards, installed flat, but with an overall height of 7 inches. These overlap and are bolted together forming a continuous structural element called a tension band. This band also acts as a header around the entire structure allowing placement of windows and doors to be easily changed. Working with second hand doors and windows upgrades can be easily installed if dimensions change. The roof may look lots better, but the flat boards in the roof are still temporary. Likewise the flimsy fiberglass panels will need to be replaced soon. The last day was a monster of getting stuff done once all the rafters were seated. It took almost half the day to make those final connections, and there was way too much to do to try and get a finished roof. In fact, getting this primary structural change in place is just the first step. Individual sections will need to have soffits and permanent secondary rafters cut and properly installed with gutters and well fastened metal roofing. 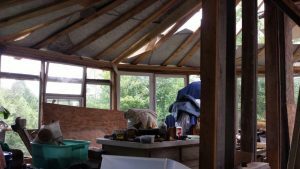 This morning I spent a fair amount of time just observing everything, and in the process saw some things that I think may be important in the actual dismantling of the existing roof and establishing the framework for the new one. So I installed some braces without actually uncovering anything. I also freed up some space near some of the walls that were obstructed, got rid of another wasp nest and then found several more that will have to go also. During some of the down time in the extreme heat of the day I was able to work with the Computer Assisted Design program and got a much better set of dimensions for the main rafters, and I also went ahead and did the first cut on all 12 of them (even though I’ll only need 8 during this phase). If the weather cooperates I should have two reasonably cool mornings to go ahead and remove the old structure and then cover everything back up quickly before the rains Friday night. I just came down from the roof, been up a little over 3 hrs with some breaks, only about 10AM now, but the heat is amazing. Looking over the progress from yesterday things look much different. Most of the old temporary roof has been removed on one side, and the center has been framed up with a scaffold directly under the Yoke (center hub of the roof of a Yurt). The fiberglass panels came off pretty easily and have been put back down temporarily in a new configuration to deal with expected thundershowers. Today I have already built a fairly substantial stairway (glorified ladder) that comes out in the middle of the yurt which will make access to the roof much more direct. Trying to even up the yoke is proving to be a little tedious, and with the heat I finally just gave up altogether. But I will go back up and start cutting the other ends of the main rafters. 12 fairly complicated cuts and they will have to be moved around, so that will take a fair amount of time, but at least the project is moving forward. and trying to find that magic combination that would let me get back to sleep. I did go up and make another cut on each of the 12 rafters and now all that remains is to start the generator and make another 12 heavier cuts to get them all ready to be installed. I’ve also been moving the top plates for the walls to where they will be needed and found several spikes that will hold those heavy plates in place when I go to set the rafters. I have that all scheduled for Tuesday when it looks to be cooler with less chance of rain, and in the meantime I can continue clearing access routes and gathering materials. 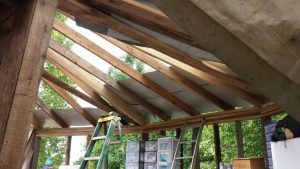 The critical next step is to get the Yoke perfectly aligned and stabilized, and finalize the connection method with the rafters. I am fairly certain it will involve very precise cutting of internal braces that will give a strong back to hold bolts to keep the rafters firmly attached. A friend of mine recognized the actual stresses on Yurt construction all tend to push the rafters in toward the Yoke and actual support comes from the walls, so the real force needed at the center is to keep the rafters from popping up or sideways at that joint. The plan is to get the south three rafters in place and a good roof structure there to allow for water proofing and placement of solar panels. This will free up the other side of the old roof so it can be dismantled and then made ready for the new structures. 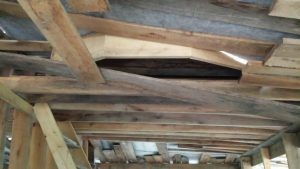 The rafters themselves are thicker than normal 2″ lumber and the ends are notched to fit exactly in all planes to the vertices of the yoke. 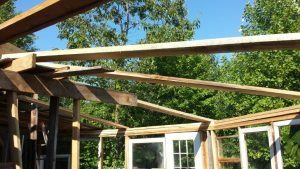 There will likely be extra supports necessary during construction, but once everything is in place and tightened up the roof will support itself. One interesting development as I get ready for this roof is the way spaces are opening up. Moving stuff around inevitably involves moving some stuff out of the structure, and condensing what remains into more organized areas. Once the south rafters and roof are in place, those areas will get a large influx of stuff from the north side so those walls can be made ready. I’m already anticipating the removal of most of the ten foot tall wall that supports the back part of the temporary roof. there are three separations on that wall’s top plates and it’s outside sections are almost ready to come down now, but the middle section is helping to support the work platform and Yoke, so other arrangements will need to be made there. 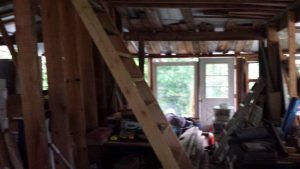 The roof is not moving along as fast as I might have expected, but that is somewhat typical for construction, especially specialized, one of a kind sorts of projects. The main stumbling block has been the wasps/yellow jackets, and I have found nests in unexpected places and only by the grace of nature, the general docility of these particular critters, that has kept me from bombing the whole place with insecticide. Although I did consider it briefly. Last night I heard the rain start, or watched the lightning, not sure which came first, and again the wind had blown all the coverings around, with tarps sagging where supports had collapsed, and the main central rubber membrane had blown away from the roof and collected inside the yoke with a ton of water pooled there, and rain running down the roof around and beside the Yoke spilling directly on the floor below. Just 1o minutes before the storm (and it actually did rain quite a lot, the weather forecast said it would be dry till weds. I even looked at the hourly predictions, and according to them, it didn’t rain last might. There has been a continuing problem area in the back where the ten foot high temporary wall support for the roof separates from the new lower plane of the roof and opens up a space for easy access of rain. So today I spent my time taking apart the problem area of the ten foot wall, leaving just the top plate isolated above the continuous covering of the integrated new roof plane.It involved taking away some of back section roof structure and the project may seem to be moving very slow, but I’m starting to get an idea that when the real roof structure is ready to go, it will move quite quickly. With more and more wasps being displaced from their nests, it seems there are more and more looking for new homes everywhere–which only makes sense. but at the same time, it is disconcerting to have them flying up every time I move a board. 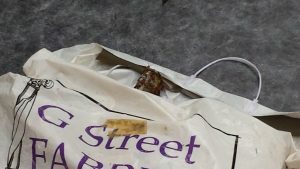 Today I found nests inside of shopping bags, and actually hit a place where I had to work around a nest, knowing they would likely attack, and there was no easy way to get at them from a distance. Maybe spraying the nest with citronella tomorrow early morning might influence them to abandon their nest peacefully. I still haven’t made the strong backs to reinforce the Yoke, but I think that will be a project for early tomorrow, and likely I will be loosening the tarp and starting the first wall plate additions and rafter installations by afternoon, perhaps even relocating solar panels in early evening, which will free up sections of the old roof to be dismantled so more rafters can be installed. Time will tell. Strange as it may seem I don’t always work on this project, and complications within a volunteer group I have been helping–or at least I thought I was helping have turned around against me and I have been distracted. I tendered my resignation and think I have wrapped up my responsibilities but really it will be tonight before I feel a sense of closure. And likely days after that before I stop talking to myself about it. How does this deal with Permaculture? The point is simply that there will be unavoidable interruptions at times, sometimes weather, sometimes gnawing personal stuff, sometimes nosy neighbors. So I think that is part of the reason I have been so undecided in proceeding with tightening the yoke and starting the rafter installation. I started out today working at cutting strong backs to reinforce the yoke, and after cutting one trial and looking at it in place have decided that the better alternative will be sturdy metal plates which I will probably have to purchase. I had some rolls of perforated metal that I had planned to use, but so far they have eluded my searches. I’m not overly fond of metal for most things, but in this case it seems that will give some flexibility to the Yoke as different stresses are applied. The other aspect is simply strength and durability, where wood may split and separate, metal will not. In trying to fit a trip to the store with routine shopping, I have a few days to do alternate tasks, so I started designing the rest of the roof framework- in between the main heavier rafters. 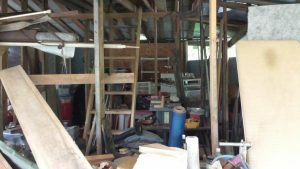 I will also probably continue my searches, look through one of the sheds a bit more, count up lumber to be sure of the flow of material between the uncovering and when the recovering begins. This actually makes a lot of sense and will likely speed things up in the long run even though it seems like a delay right now. The roof is in a relatively stable condition and not as prone to leaks. A few days from now the temps will drop to lower 80s with clear weather, and I’ll be able to work right through the day much easier. So the main thing now is a materials list and saving energy to start again over the weekend and next week. Well, we finally got a real rain and the new temporary roof leaked pretty good in some new places and not at all in some others. This last bit was probably the worst of it before I put on the push to start installing the new roof on Sunday. I actually got quite a lot done cleaning up and clearing floor space against the back wall. That area was so cluttered and still had several wasp nests and I really had no idea how that would proceed. This morning I went up there with a little ambivalence of what to do, and then I decided to move out the main wasp nest I knew about. I actually was very timid about starting it, especially after being stung so many times by the ground hornets, but these guys were relatively mild mannered and once I decided to just go ahead and trust them, moving the bag they were camped out on went fairly easy and I carried them outside to a fair distance from the house. As much as it poured today I actually felt a bit sorry for them out there, strange as it may seem. I started out feeling mostly annoyed at their numbers and constant flying out every time I touched something. Like most people, I have at the very least a healthy respect, bordering on fear for anything with a stinger. Many times I have accidentally lifted something or moved something only to find out later there was a nest on or near it. The nest today was a good case in point. A couple days ago I was clearing another area and that bag was one of the things I picked up and gave a slight toss. As it landed I saw there was a nest there near the mouth of the bag and experienced a little adrenalin rush at the close call. Today though I ended up carrying the bag for some distance, and as I moved it and they just sort of sat on the nest behaving themselves I actually started to think of them more like a pet than some obnoxious enemy. They do eat other bugs, and I have noticed there are not many other bugs around there. Even though they are not supposed to eat many mosquitoes, I never saw any mosquitoes at all in the house until recently after I had made a significant dent in the population. Anyway, I cleared a very large area of floor space and have lots of stuff near the doors ready to go outside. The way things are progressing I expect another two weeks before I’m ready to go back to surveying for the next backhoe rental. The roof itself should mostly be in place and watertight by the end of next week. 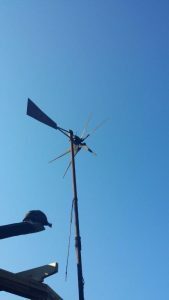 Finer touches like built in gutters, plywood and metal should mostly be in place after the second week with things fastened enough to not blow around in the wind. I may not get the whole roof perfect this year, and most likely most of the walls will still be temporary, but at least I won’t be looking for leaks every time it rains or chasing roof panels around when the wind kicks up. 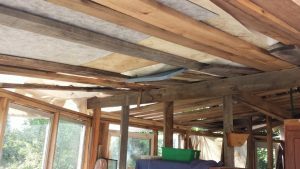 Lots going on since I wrote last, with 4 sections (of 12) having new main rafters installed, fiberglass panels underneath and the tarp on top, but in between the rafters the framework is just 3 long boards laid sideways between the yoke and the walls. It’s just enough to support the fiberglass panels, which are far from watertight, and the tarp which is also a religious experience (holy). I was spurred on to work faster because of the threat of rain tomorrow, which has evaporated since Monday’s long range forecast. Now they are saying Friday afternoon showers, so my hope is to get lots more at least marginally covered. I do have another tarp that was taken off two years ago, and lots more panels, so the situation is doable. I noticed the remaining rafters will need to have travel areas cleared just to be able to orient them properly. 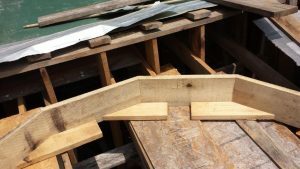 The yoke platform was installed with a slope to help drain water in the early stages, but now that slope will make it difficult to install some of the rafters. One example of the numerous side trips this project has entailed was moving the table saw bench (with all the accumulated tools and material on around and under) so I could build a separate 8 foot high wall as part of the new level platform that actually supports the whole yoke and gives more room to walk. Moving the solar panels was difficult, the first move this morning enabled me to get all the fiberglass panels off the roof, but the second move this evening actually got them closer to their final destination. Out of 5 panels though I noticed a wire had pulled loose from one and will need repair. Since I don’t really monitor amps from the panels it’s difficult to say when that happened. The glue that holds the electrical box to the back of the panel had given way and the dangling box put stress on the more fragile internal wiring of the panel. Tomorrow will likely involve lots more clean up (and out). 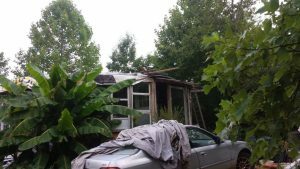 But I will still try and get several more sections at least under a tarp cover and get the place ready to handle a thundershower if it happens. It’s a bit nerve wracking to know that much of the house is totally unprotected if it should suddenly start raining- even if it doesn’t rain. With all the leaks from before, even this quick cover up will likely do a better job. But the framing that is going in place is the real key to movement toward a real roof that will take wind, rain, and snow loads without so much worry. I also look forward to harvesting more water from the new roof. With some luck, by the end of the day Friday I may have some sections well framed with tin in place and gutters started to keep my water harvesting in place. What a day, even though there was a possible thunderstorm in the forecast, by afternoon I was nowhere near being ready to add a lot more weight to the roof. I started to get caught up in readjusting everything for a new height. 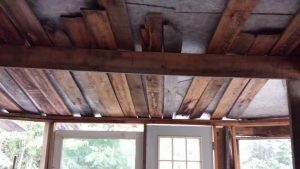 The issue started with the first rafter which was only an inch or two too long, then the next rafter was even longer, and the one after that longer still. It would seem the overall height needed to go up so I started to lift the yoke up using blocks under it, and sure enough, the rafters on one side that were fitted exactly are now loose. The new rafters are not yet high enough to fit in, and there are only three more rafters to install before they are all in place. Tomorrow morning I’ll focus on removing the tin from the back temporary roof, then dismantle that structure. That will open up the final four sections to add rafters to, and once they are all sitting in place I will probably have to take apart the covering on the first four sections to lighten the framework so it can be moved around easier. As the yoke goes up in the air it will get to a point where it will have to move laterally, and that may prove impossible with all the extra weight on it. It is actually not as difficult as it might seem, since the temporary nature of the covering meant that the only things that will have to move will be the three 6 inch boards in each section, and sliding them away from the center can all be done right from the center of the yoke, and the boards then can rest on the platform and the wall at the other end, with no weight on the roof framework. this will also carry some of the weight of the fiberglass panels and even the tarp, although not all. I would be surprised if I got all that done tomorrow, taking apart the old roof will be plenty of fun for one day. If I get the last rafters up and on the wall that will give me plenty to think about in planning any adjustments. It’s been two full days of work and just a bit this morning before going to town on the weekly supply run. The rafters are almost equally divided between the ones fitted where they belong and those just close, sitting up on top of the wall. The back wall is now tied in quite well, although it was pretty far out to begin with and needed some persuasion. The key element here is raising the center enough to get the rafters to settle into place. The yoke is about 4 inches short of the specified height on one side, but a little high on the other. Yesterday I found a way to take all the weight off the center support and carried it on two 2×8’s strategically placed. It was actually unforeseen that I could get that much weight off the center platform, but when I saw how well it worked I took the opportunity to dismantle the old platform. Originally I was more focused on just getting the yoke assembled, and height measurements were only approximate. A that stage I thought the whole roof structure would be a few inches taller than necessary and everything would fit easily. As it turned out though it was actually several inches shorter, and that seemed to be the reason for the tight fit on some of the rafters. I finished some of the finer points of the new platform this morning, and while there is a bit more to do it is now self supporting and those old walls can come down. I proceed with raising the yoke closer to it’s final height and started to think about more temporary structures coming down. The threat of storms two nights this past week worried me some, and I had started to rush to cover the yurt with panels and tarps, but now all that extra weight will need to be removed temporarily as I start to move the yoke closer to where it belongs. 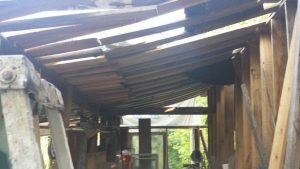 I recently checked some of the angles, and it has deformed somewhat also, although with mending plates firmly attached on the inside it is still structurally ok, and once all the rafters are in place, it should naturally push itself back into the proper shape. Anyway, this has been a day of easier work, which I needed after moving all the junk off the back walls, cutting them down to size, pulling them in, installing new top plates, removing parts of the temporary walls, stabilizing the remainders, then moving stuff back out against the walls to get it out of the way. Where does the time go? Generally the roof performed well, with the exception of a couple spectacular events. On first inspection, opening the trap door to the second floor, water was pouring in right along the wall due to insufficient overhang. I remedied this quickly with a piece of aluminum siding that extended the tarp another few inches past the wall edge. That corner generally had a few other issues where the old temporary and new temporary merged. The flat area in the center all looked sound for some time, then suddenly a big splash from a gallon or two of water in a sagging pocket of the rubber membrane that distorted and finally spilled. I took up another oak board to span the yoke and fill in the gap where the membrane sagged, also smoothed out wrinkles on the lower edge to let water drain more effectively. 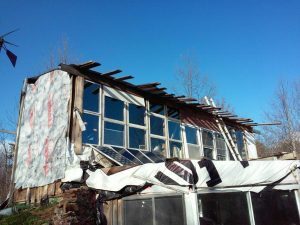 The system of fiberglass panels covered by a tarp, although each is somewhat leaky individually, performed quite well. The rigidity but uncertain waterproofing of the panels a perfect complement to the sagging but more waterproof tarp. 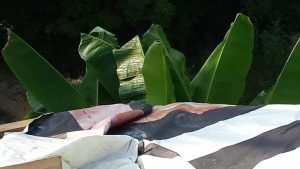 Using tyvek as a part of the tarping system also proved quite effective, although areas where I didn’t use enough panels or boards to provide structure did tend to pool, and tyvek is not perfect enough at holding water to be a good pond liner, so those sags gave a continuous drip. I have decided to immediately remove the rest of the temporary structure in back as soon as I see three or four days with no rain in the forecast, hopefully starting tomorrow. This will give me extra space to manipulate those final three rafters and get them attached to the yoke. Currently they are simply laying supported by the wall and the central platform near where they will be installed. Today started out dismal with the rain forecast going later and later, until I finally started work a little after 10 praying that the threatening clouds passed by without causing mischief. I did get lucky on that account and by the end of the day managed to get almost all of the old roof out of the way. I did not have time to get all the rafters seated properly, with the last 4 close to their position, but not locked in.. The forecast is calling for two more days of clear weather, so tomorrow I plan to take my time solving the issues around locking in the last rafters.This is really a major part of the structure, and could easily get skewed even worse, so there’s no sense in rushing. Obviously, with a couple more people working on it everything could have been dismantled all at once, and there would be no issue now with the structure being somewhat out of balance due to starts and stops and trying to keep everything protected when the storms approach. 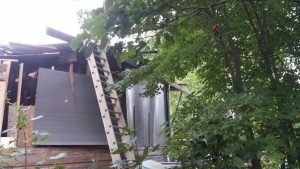 If necessary i will remove some of the weight from the structure and then get back to work with just the 12 rafters until they are taken care of, then add everything back on again. But I will try some jacks first on the heavy side where some of the rafters are too loose, and push them up and out to take some of the distortion from the yoke, and then one by one work with the rafters that need extra space and see If they can be fitted. I did not achieve my basic goal of setting all the rafters. I lifted the yoke another 4 inches, and things are definitely closer, but with 8 inches of blocks supporting it I hesitate to start doing too much to force it into place. It has been quite hot today and that has slowed me up quite a bit, with the morning mostly taken up by clearing that last bit of the old temporary wall. I tried various techniques beside just lifting, including hitting portions with a sledge hammer and prying other parts, and I think the answer for now will be to fasten all the rafters to the yoke, install a secondary top wall plate only in the corners to catch the remaining rafters wherever they may fall. I also plan to stiffen the yoke with internal braces to force it to hold it’s shape as I do one last round of manipulation. Like I said, it’s not that the techniques aren’t working, just that they have not gone far enough–yet! Tomorrow is another day, supposed to be cloudy so it will be easier working up top, and with the yoke as high as it is now, maybe the answer is simply more substantial blocking and taking everything another 2 to 4 inches higher. I also need to double check the CAD parameters to see if I miscalculated or am missing something that is causing such a headache. 6:30 am revisited the CAD design to double check all dimensions and discovered an error in measurements. On the 12 sided figure the original distance measured at 12’6″ turned out to be an error, probably of cursor placement, and as I verified the measurement at other points around the figure, it turned out that 12’3″ was the better dimension. This translated to a 2″ difference in the diagonal calculated from that figure, and was the reason nothing was working with the rafters fitting into their slots. 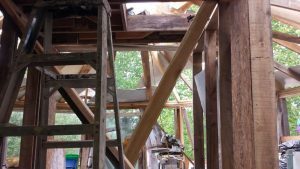 First thing I did was to go up top and shorten every rafter by 2″. Then I started the job of moving the yoke and attached rafters enough to finally get every rafter seated properly, with the yoke well supported. 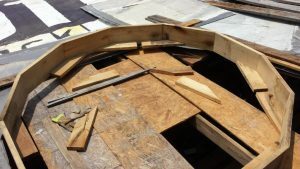 What followed was directed to installing as many secondary rafter components as possible, cleaning and stacking and reusing whatever could be put into basic construction features that would enable a quick rough covering of the structure in preparation for several days of storms. Much of the new roof structure has a temporary metal covering, interspersed with fiberglass panels and bits of the tyvek here and there as well. There was not enough time to do all the finish work necessary for a really sound roof, and i do expect to make adjustments as things progress, probably the first adjustment will be to connect the separate roof members into a structure that can be easily walked on to make the actual finish roof surface possible. That solid roof structure will also be necessary to support solar panels, and water collection. The main thing was getting the primary roof structure tied into the walls, now that they are and the first temporary cover of the structure is in place, other details can be added at a more leisurely rate. 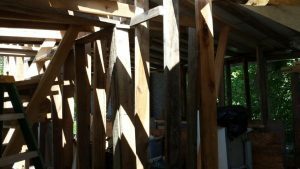 The beautiful part of the Yurt from a construction standpoint is the way forces counterbalance each other, with the weight of the roof and the tension band around the walls in a dynamic equilibrium. Once all the rafters locked down into place I breathed a real sigh of relief. Tomorrow with slow rain in the morning I will likely walk around outside putting up used tyvek, not much good for a roof, but excellent for walls. I even have some vertical siding boards that might be useful, as well as a window to install. If the rain drives me inside there is lots of clean up and organization to continue with. Setting up the new shop and storage is a high priority. I think this last week has been primarily one of recovery. We’ve had a few rains, with very minor leaks. A survey of materials tells me I can find enough metal roofing (with some careful planning and good cuts) to cover the entire structure. 7 of 12 triangles have a rough framework of rafters, but the real weight of the roof has not yet been installed, with about 50% of the rafters and structure still to be finalized. The temporary cover has performed so well the temptation is to leave it alone, and most of my energy has really been directed at cleaning up inside. Organizing my stuff, bringing stuff back inside and trying to integrate it with stuff already there. Trying to figure out the storage system that will really give me access to the vast array of stuff. And then in the back of my mind is the nagging thought that there is a wider project going on and likely my energy needs to shift to the outside main frame water design.